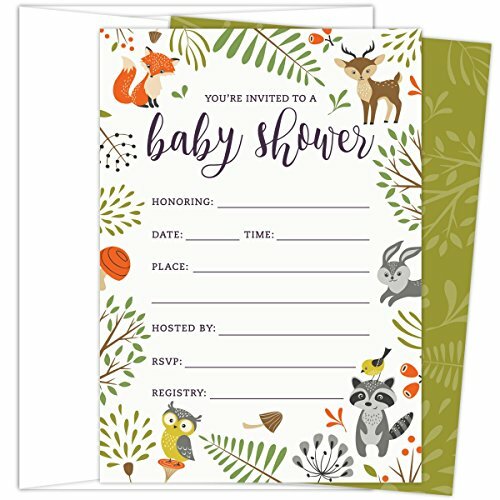 Woodland Baby Shower Invitations with Owl and Forest Animals. Set of 25 Fill-in Style Blank Cards and Envelopes. Unisex design suitable for boy or girl. Celebrate the mommy-to-be with these invites designed and produced in the USA by Koko Paper Co. Your satisfaction is guaranteed. If you're not completely satisfied with your purchase, please contact us for a no-hassle full refund. ♥ Celebrate the mommy-to-be with these whimsical, warm and charming invites. ♥ Set of 25 4.25" x 6" cards with matching white A6 envelopes - generous space for writing. Convenient and practical blank, write-in style, usable for multiple events. ♥ Printed on front and back, on thick, 140 lb uncoated heavy cover stock. Easy fill-in with any type of pen without ink smearing. ♥ Luxurious AND economical, these invitations are proof that you do not have to spend a lot of money for high-quality, wonderfully made products. ♥ Designed and Printed in the USA. If you have any questions about this product by Koko Paper Co, contact us by completing and submitting the form below. If you are looking for a specif part number, please include it with your message. © 2019 - myathenas.com. All Rights Reserved.